“I had to rethink my approach to food whilst pregnant.” Blogger Alicia in the UK felt everyone she asked gave her conflicting advice, so she consulted a nutritional therapist. Here she shares good advice and tips for a nutritious pregnancy diet. Pregnancy diet tips. Choose natural, fresh foods, and eat plenty of green leafy vegetables and wholegrains. Please keep in mind that advice on what to eat when pregnant will vary from country to country. You can find more detailed advice for UK by following the links on the NHS Choices website at www.nhs.uk. See the info box at the end of this article as well. Suddenly it wasn’t all about ‘Me’. Pre-children, a peek in my fridge would have uncovered little more than a pack of Starburst, a pint of milk and a bottle of rosé. That all changed when I first fell pregnant and the concept of ‘we are what we eat’ took on a whole new meaning. Suddenly it wasn’t all about ‘Me’. My wants and needs, although very present, were no longer the priority and all that mattered was nurturing this new life growing inside me. Which meant rethinking my approach to food and learning how to make conscious choices based on nutritional value instead of convenience. The problem was, I found pregnancy nutrition to be a minefield. My doctor told me one thing, my midwife another and the books something else. Then there was my mother who didn’t abide by any of the new ‘pregnancy food rules’ telling me that a little of everything is perfectly ok. I felt stressed out, confused and non the wiser. I had to to make conscious choices based on nutritional value. To clear up any confusion surrounding pregnancy nutrition, I got in touch with Nutritional Therapist to the stars Gabriela Peacock (who famously helped Katherine Jenkins in her pregnancy) to pick her brains on and find out exactly what we should eat through pregnancy and how we can shift the extra pounds afterwards. I got advice on what to eat when pregnant and tips to help me rethink my approach to food. Pregnancy diet is about choosing wisely. Here’s what I learned. Eat wholegrain, starchy carbohydrates at each meal. Slow release varieties, such as porridge oats, rye bread, brown basmati rice and pearl barley, will keep you feeling fuller for longer and provide energy when levels are flagging. Focus on natural, fresh, whole foods. Fresh fruits, vegetables, whole grains, lean meats, yoghurt, eggs, beans, legumes, nuts, purified water and seeds should be the mainstay of a pregnancy diet providing the highest nutritional value for you and for your baby. Eat two portions of oily fish, such as salmon, mackerel, sardines and trout, a week. High in Omega-3 fats, they contribute towards shiny hair and glowing skin for you and the development of a healthy brain and nervous system in your baby. Do be careful of the mercury content in certain fish. Go green, eat fibre -ich foods and think about portion size. Go green. Green leafy vegetables are a rich source of vitamins and minerals including iron, magnesium and folate (aka the natural folic acid) necessary for the production of new DNA, and new cells in the foetus. 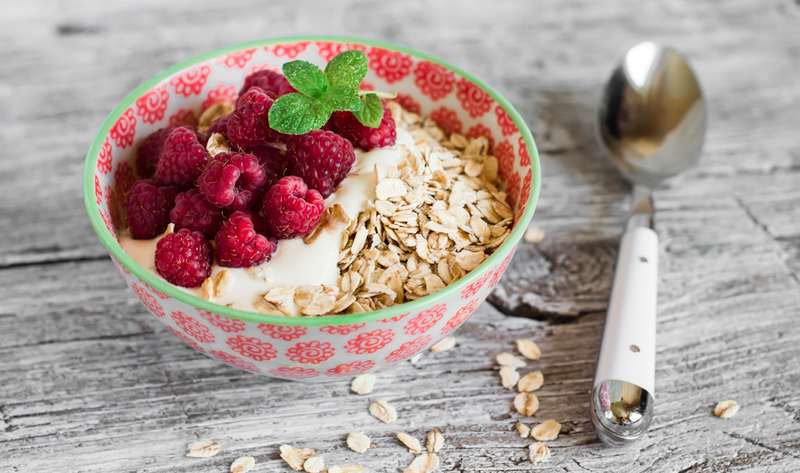 A bowl of plain yoghurt with muesli and berries makes a delicious and filling snack. Snack sensibly. Being pregnant, contrary to belief, is not the green light to eat whatever, whenever. Snack on nuts, seeds, fresh fruit and natural yoghurt. Limit refined sugars, nonorganic dairy and meats and artificial sweeteners. Eat fibre-rich foods. Pineapple in particular is a nutrient-rich fruit that is low in saturated fat and contains fibre which can help to ease constipation, a common complaint during pregnancy. Think about portion size. Portions don’t need to be bigger than normal, but you might find you need to have some nutritious snacks during the day (see above). Foods to avoid. Foods that should be avoided altogether include non-pasteurized dairy products, soft cheese, undercooked or processed meats and poultry and undercooked eggs . Increasing your intake of fruits and vegetables to at least 5 portions a day. Try aiming for food with super skin nutrients vitamin A, C and E.
Vitamin A. For a golden glow (and to keep deep wrinkles at bay) vitamin A is the ticket. You’ll get plenty of it in both orange and green foods like carrots, spinach, broccoli, and kale. Eat omega-3 fats. Found in oily fish like salmon, Omega-3s form part of the cell membrane that helps to hold the skin cell together, vital for healthy skin. Folic acid. Don’t forget to take a daily does of folic acid, essential to maintain healthy foetal development. Extra vitamins. Extra supplements we may want to add include; vitamin D, iodine, calcium, iron and omega–3 fats. Alternatively, opting for a good pregnancy multi-vitamin will ensure you have all basis covered. But always consult your midwife or GP before taking vitamin supplements. Always a keen fitness fanatic, former magazine editor Alicia Irvine-MacDougall set up Editor’s Beauty after being inspired by her own experience of pregnancy and parenting. As the first of her friends to have children and with over 10 years’ experience working on fashion and beauty publications, Alicia quickly became the go-to-gal amongst her friends for advice on pre & postnatal exercise, nutrition, beauty and regaining that pre-baby confidence. A hub for mums and mums-to-be, Editor’s Beauty provides insider tips on everything from exercise and nutrition, to stylish yet kid-friendly retreats, and beauty products and treatments that actually work! Try to eat two portions of fish a week, one of which should be oily fish, such as salmon, sardines or mackerel. There are some types of fish you should avoid in pregnancy. For more information, follow the links on NHS website. Don’t eat liver or liver-containing products, such as liver pâté, liver sausage or haggis, as they may contain a lot of vitamin A. Too much vitamin A can harm your baby. The Department of Health also advises you to consider taking a vitamin D supplement. Get more information from NHS Choices here.